Simple output queue handler that makes sure all packets of the same flow are sent to the same queue. We support different kind of q handlers. Have a look at "autofp-scheduler" conf to further undertsand the various q handlers we provide. Definition at line 95 of file tmqh-flow.c. References PacketQueue_::cond_q, Tmq_::id, TmSlot_::id, ThreadVars_::inq, PacketQueue_::len, PacketQueue_::mutex_q, PacketDequeue(), TmqhFlowMode_::q, TmqhFlowCtx_::queues, SCCondWait, SCFree, SCMalloc, SCMutexLock, SCMutexUnlock, SCRealloc, TmqhFlowCtx_::size, StatsSyncCountersIfSignalled, TmqCreateQueue(), TmqGetQueueByName(), trans_q, and Tmq_::writer_cnt. Definition at line 211 of file tmqh-flow.c. References TmqhFlowCtx_::queues, SCFree, SCLogPerf, and TmqhFlowCtx_::size. Referenced by TmqhFlowRegister(), and TmqhOutputFlowIPPair(). Definition at line 223 of file tmqh-flow.c. References PacketQueue_::cond_q, Packet_::flags, Packet_::flow_hash, TmqhFlowCtx_::last, PacketQueue_::mutex_q, ThreadVars_::outctx, PacketEnqueue(), PKT_WANTS_FLOW, TmqhFlowMode_::q, TmqhFlowCtx_::queues, SCCondSignal, SCMutexLock, SCMutexUnlock, and TmqhFlowCtx_::size. 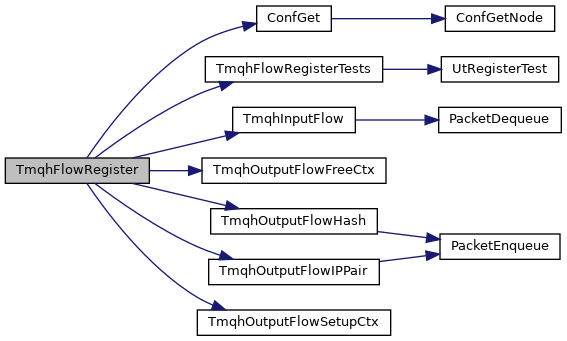 Referenced by TmqhFlowPrintAutofpHandler(), and TmqhFlowRegister(). select the queue to output based on IP address pair. Definition at line 254 of file tmqh-flow.c. References PacketQueue_::cond_q, Packet_::dst, Address_::family, PacketQueue_::mutex_q, ThreadVars_::outctx, PacketEnqueue(), TmqhFlowMode_::q, TmqhFlowCtx_::queues, SCCondSignal, SCMutexLock, SCMutexUnlock, TmqhFlowCtx_::size, Packet_::src, str, TmqCreateQueue(), TmqhOutputFlowFreeCtx(), TmqhOutputFlowSetupCtx(), TmqResetQueues(), and trans_q. Parses a comma separated string "queuename1,queuename2,etc" and sets the ctx up to devide flows over these queue's. Definition at line 165 of file tmqh-flow.c. References SCFree, SCLogDebug, SCMalloc, SCStrdup, str, and unlikely.